Even the thought of renovating a room can be scary and we understand that. So why don’t you let us at Starplan Fitted Bedroom Showroom Wednesbury do all of the hard work? After all, it’s what we’ve specialised in as a company for over four decades. Everything we do at Starplan bedrooms revolves around making sure that we turn your dream bedroom into a reality. 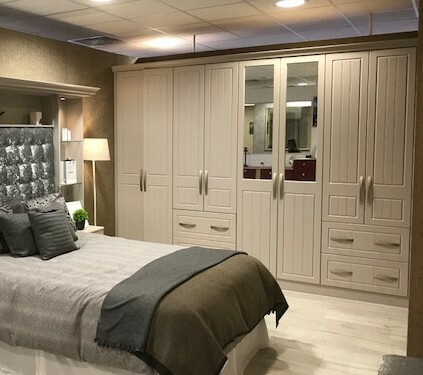 Our fitted bedroom showroom is brimming with bespoke fitted bedrooms, free standing furniture and a range of customisable sliding wardrobe doors. 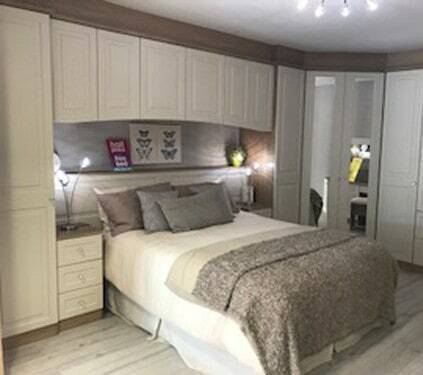 We have planned out and created a fitted bedrooms showroom Wednesbury in the hopes of providing you and all our customers with inspiration. Once you’ve been inspired by our Wednesbury bedroom showroom, why not book yourself in with our in-store bedroom design gurus? All you need to bring with you is your room measurements, for a free no obligation quote with fitted bedrooms from £1,500! The beauty of fitted bedrooms is exactly that, they can be fitted to any shape. We will work with you to make sure that we can utilise your space to the best it can be and create an area you enjoy spending time in. Address: Javelin Park, Hallens Drive, Wednesbury, WS10 7ND. Our team of expert designers offer a free bedroom design service, but it doesn’t stop there. To make sure that your journey with us is the best it can be, we also provide a gratuitous delivery and bedroom installation service. All of our high-quality bedroom furniture also comes with a manufacturing bedroom guarantee. 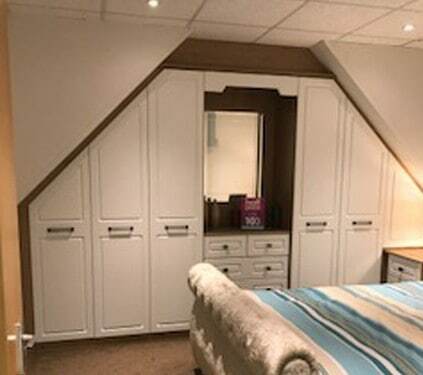 Freestanding bedroom furniture has a 5-year guarantee whereas fitted bedroom sets come with 10 years. Starplan knows that life doesn’t always work out as planned and we want to make sure you have peace of mind whenever you purchase off us. Our Fitted Bedroom Showroom Wednesbury is open seven days a week and based on Javelin Park which is just off Black Country New Road. All of our brilliant team are equipped with the knowledge to help you with all of our furniture styles. Just know that you’ll be in good hands when you come to visit us in store!